Louis Orlando (Ludovic Orlando) from the University of Copenhagen described the 14 genomes extracted from buried in the Scythian graves of the corpses of stallions. Due to this, the scientist was able to find answers to the big questions of evolution of man domesticated the horse. Orlando presented their findings at the seminar on genomes, which was held in may at cold spring Harbor (USA), and briefly about the report, reports Science News. Biological material was collected in Eastern Mongolia and Western Kazakhstan and it dates back to the II-I millennia BC (this period had the middle of the process of domestication). The remains of 11 stallions (one generation) have been extracted from the tomb of the Scythian chieftain, the rest are found in other places. Scientists tried to find out, whether were characteristic for the ancient horses such features of modern animals, as the abundance of malicious DNA (a consequence of centuries of inbreeding) and identical Y-chromosome of horses — due to the fact that the first breeders were inseminated herds of mares with just a few males. However, as discovered Orlando in the era of the formation of the first nomadic cultures of Eurasia, harmful DNA has not yet begun to accumulate in the genomes of horses and mares were mated with many stallions. Moreover, at this period the domesticated horse continued to interbreed with wild individuals. Now plans for Orlando — to sequence the genomes of a hundred horses from the territory of all the ancient civilizations of the Old world, from China to Rome to close all the dark spots in the history of the adaptation of horses to life together with the person. 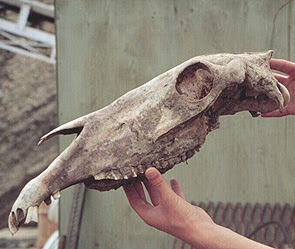 In 2014 the scientist and his colleagues have sequenced the genomes of ancient horses from Taimyr (their remains are dated to the 14th and 41st millennia BC) and compared them with the genomes of five modern breeds and Przewalski’s horse (the only living descendant of the extinct wild horses of Eurasia). They have identified at least 125 sites that have changed under the influence of domestication.